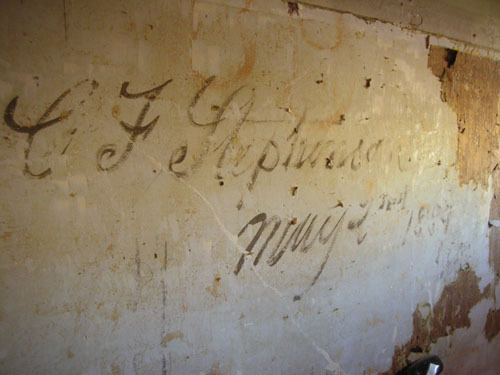 For reasons unknown to Yours Truly, a ridiculous number of people have written on the walls of this house over the years. That'd be close on exactly 120 years ago, people. 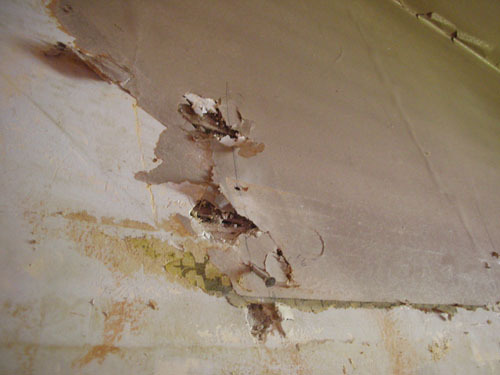 In that time nobody has seen fit to strip the wallpaper down to the plaster. Somehow, I find I prefer C. F.'s ephemera. They had very nice penmanship. Will you attempt to save these? Jan, we really can't save them unless we cut them down from the wall and put up drywall there. 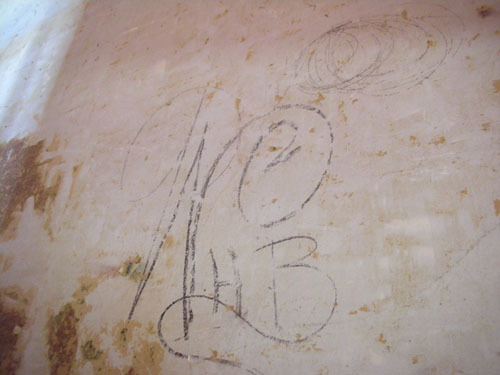 I'm torn; this is the first really interesting thing we've found written on the walls (apart from "Whoever took down these panels is a bufu," of course). My sharpened former editor's eye is pretty sure that is a C.F., not a C.J. Right you are, gwen. Shows how out of the habit of reading longhand I am. When we moved in to our last house we had a contractor remove some wallpaper. 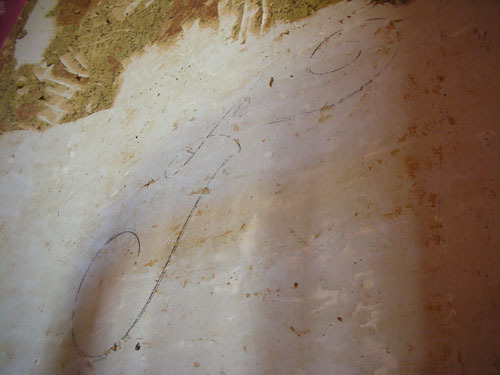 My husband and I came home to very large swastikas, probably drawn before the paper was put up in the sixties. I turned to my jewish husband and said "welcome to the neighborhood". Good lord, priscilla. Talk about your good reasons for staying up all night putting on five coats of paint. Ayse - love your light switches! we have them too :-). 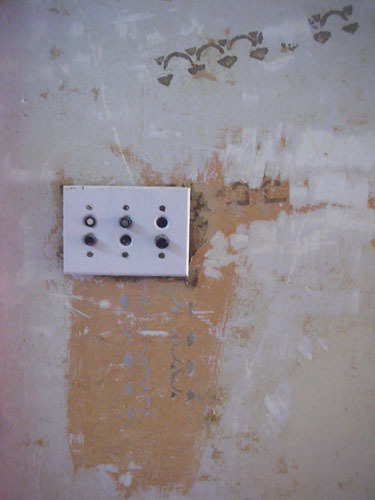 in fact when we rewired the house we found a place that makes reproductions, includes dimmers, etc. fyi. back to the garden post. do you have an opinion or experience with the North Star cherry tree? Dwarf variety which would be good in my tiny space. You gotta wonder about prev owners. I found a picture of someone on a hangman's noose, with the caption, My Mom is a Pig. hmmmmm. I don't know North Star cherries at all, Carol. We have Black Tartarian (because Noel likes them), Lambert, and Stella. All three are great, but I suspect that any cherry tree would be great if you grow it yourself and then pick the fruit ripe (most store cherries are picked unripe). 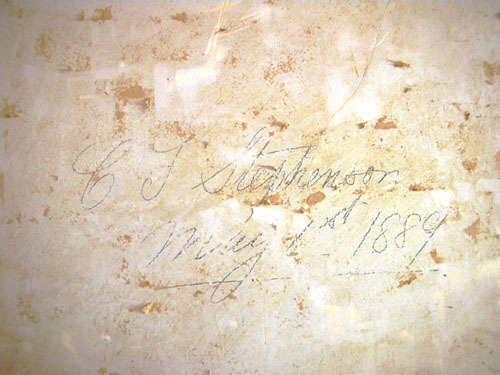 You could put up a frame around the signature and just paint around it... oh how I wish you guys lived near me, I a dying to do some reno work on an old Victorian. I second Diana's opinion. I've seen this done in several old house restoration tours. Or maybe take very detailed pictures of the signatures you like, print them out and frame them as artwork. Good luck!